Scientists from across Europe who are leading the fight against superbugs will gather at Queen’s next week (14-15 September) for the joint INBIONET/Infect-ERA Conference. Delegates attending the conference will contribute to discussions on some of the most deadly infectious diseases and will present the latest findings to shape future treatments of infection. They will join researchers from Queen’s who are pioneering a new approach in the ‘arms race’ against antibiotic resistant infections. Queen’s scientists are working towards the development of new therapies to boost the body’s own defences against infection, rather than trying to beat the bugs by attacking them directly with antibiotics. The method is called ‘host directed therapeutics’ and it focusses on identifying the ‘Achilles heel’ within the immune system that allows infection-causing microbes to take hold. 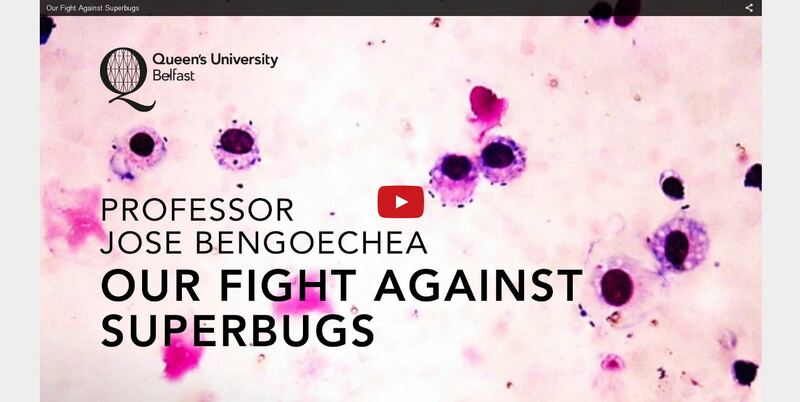 It is one of the approaches that will be discussed during the two-day event, hosted by Professor Jose Bengoechea, Director of Centre for Experimental Medicine at Queen’s, whose research into combatting the multidrug-resistant microbe Klebsiella Pneumoniae is recognised worldwide. The conference marks the end of the four-year INBIONET programme (Infection Biology Training Network), which is led by Queen’s and funded by the Marie Curie Initial Training Network Scheme as part of the EU’s Seventh Framework Programme. This Network integrates seven academic groups internationally recognised in the fields of microbial pathogenesis, innate immunity and molecular recognition together with intensive research SME, Preclin Biosystems and a multinational pharmaceutical company, Sanofi-Aventis. The programme is at the interface between microbiology, immunology and cellular biology and aims to explore some of the most novel themes that are beginning to emerge in the mechanisms by which pathogens manipulate host defence responses. Media inquiries to Anne-Marie Clarke (Mon-Wed) or Michelle Cassidy (Thu-Fri) at Queen’s Communications Office, tel: +44 (0)28 9097 5310.